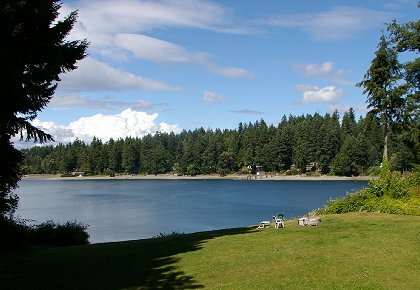 Small Oyster Bay connects with the larger Ostrich Bay, which connects to Puget Sound. 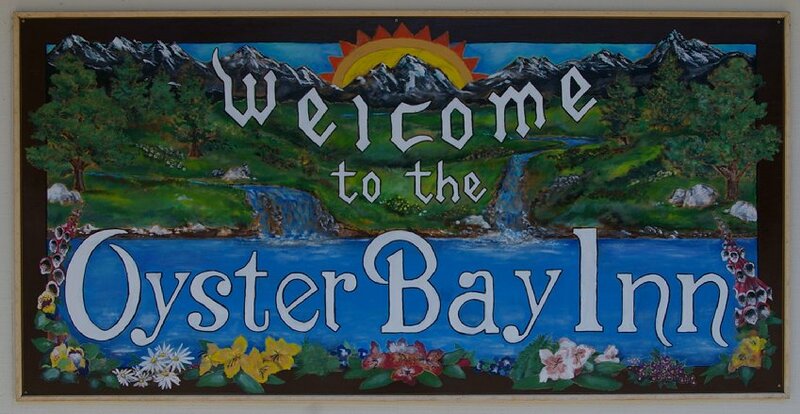 The Oyster Bay Inn is located on the shores of Oyster Bay. If you are only interested in four star hotels, pass the inn by, but if quirky appeals to you, then we highly recommend this hotel. Around the curve of Ostrich Bay is the much newer, much nicer hotel, The Baymont Inn, but as they say in real estate, "location, location, location." Our room at the Oyster Bay Inn had a small balcony and a fantastic view and was only about forty yards from the water's edge. The entrance to the inn and their office is on the fourth floor (top floor), which meant we used the elevator to go "down" to our floor and "up" to the lobby, which is the reverse of normal hotels. This means a hesitation at the elevator buttons and requires thinking each time you board the elevator. A kitchenette adjoined our bedroom. If you want to prepare some of your own food this is a money saver. 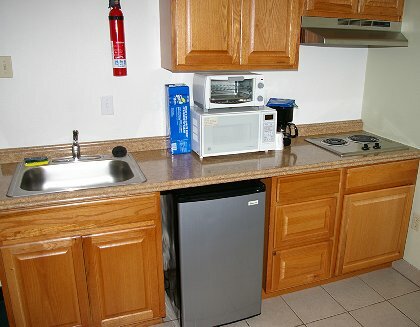 It's equipped with a microwave, toaster oven, sink, stove top, and refrigerator. The utensil drawer revealed two forks, two spoons, two knives, and two steak knives. Although we don't generally cook on our little vacations, we do eat and the kitchen allows for easy left-over snacks. We checked in and moved in our suitcases, books and other travel gear. The room only had one table lamp by the bed, but a simple call to the frontdesk delivered one in a jiffy. The staff is very accommodating. Once we had made ourselves at home, we both read a little bit before leaving for dinner. We had reservations at the Bremerton Bar and Grill, which is located in downtown Bremerton near the ferry dock and just a few minutes from the inn. Downtown Bremerton is constantly building even with the growth of nearby suburban Silverdale. Downtown has a new theater and the convention center is only a few years old. There are potted/hanging flowers and sculptures on most corners in the downtown core. 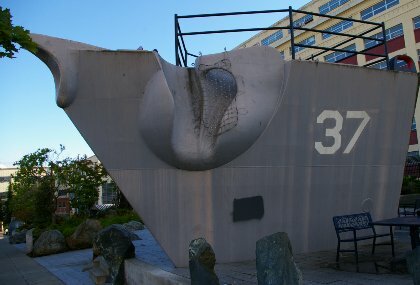 This huge sculpture representing the bow of a ship signifies the importance of ships to the Bremerton area. For years the USS Missouri was docked here before becoming one of Honolulu's main tourist attractions. In World War II and ever since, Bremerton has been a refitter of the US Navy. My friend Ernie Brazil, a one-time member of the Rotary Club of Tacoma #8, came to the Pacific Northwest from Georgia at the beginning of the war to work in the ship yards of Bremerton. Eventually he became a well-respected minister in Tacoma, before returning to his Georgia roots fifty-some years later. 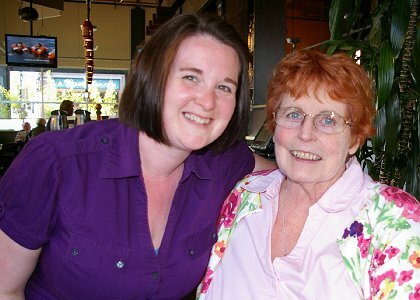 Today, Peg and I have a niece who lives in Bremerton and has worked in the yards for nearly thirty years. Ships and the sea are vital to Bremerton. Along the waterfront you'll find more than scuptures, too. 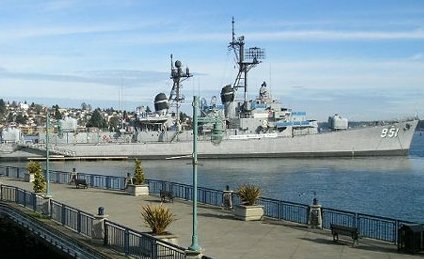 The USS Turner Joy (DD-951), famed Navy destroyer from the Vietnam War, is now maintained and administered by the Bremerton Historic Ships Association. The museum ship and memorial honors not only the men and women of our modern US Navy, but also recognizes the accomplishments of those who help build and maintain the Navy's ships as well. An active and educational facility makes the USS Turner Joy a unique and lasting legacy to Puget Sound's maritime heritage. Tours onboard the USS Turner Joy are available all year long. If you have a group, you can even arrange for an over-nighter onboard. Connecting the cities and islands of Washington State is the Washington State Ferry System. Ferries criss-cross Puget Sound every day delivering drivers, walkers, and bikers to work and play. The Seattle-Bremerton run delivers both workers to downtown Bremerton from Seattle as well as workers from Bremerton to downtown Seattle. The size of the ferries vary depending upon the general traffic. Distances vary as well. For example a trip from Steilacoom to McNeil Island only takes a few minutes. The run between Port Angeles and Victoria, British Columbia takes about an hour and a half. 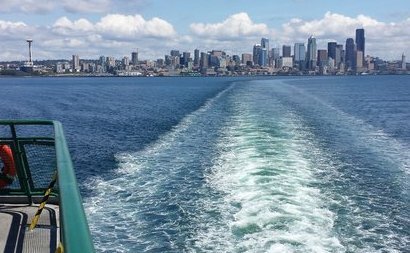 The trip from Bremerton to Seattle runs almost an hour. 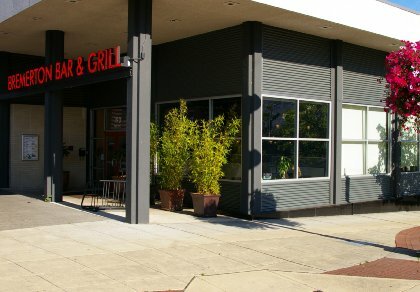 The road (Pacific Avenue) to the ferry in downtown Bremerton runs right past the Bremerton Bar and Grill (2nd and Pacific). The trip from the Oyster Bay Inn to the Bremerton Bar & Grill took about ten minutes. We parked about twenty feet from the front door. The hostess tried to sit us in a tiny, dark, two-person booth in what she called "the dining room". She didn't seem very helpful when we turned up our noses at her selection. We finally were shown to a nice table in the bar. If the day had been a little warmer and a little less windy, the overhead garage door next to our table would have probably been open. As it was there were people dining outside. Our very friendly and helpful waitperson, Michelle, saved the day. She made recommendations and cheered us up immensily. We began our meal with crusty grilled cauliflower. The food was good, but I'm guessing it was mostly microwaved. It was delivered so quickly, it had to be. If the cauliflower had trully been grilled, it could have an a little more color and crust. The interior was really hot, which says microwave. My meatload with a bourban glaze was very good. Covered with little onion rings and asparagus it cried for ketchup, but I really enjoyed the flavor. Peg's salmon was deliverd over-cooked, even with directions from Peg stating how she likes it cooked. Michelle quickly appologized and had a replacement back to us within minutes cooked perfectly. The roasted red potatoes also had the feel of being warmed up rather than fresh roasted. They were disappointingly chewy rather than crunchy. Servers quite often make or break a restaurant. Michelle did a fantastic job for us. She had mentioned that the meatloaf was one of her favorites. Mine, too. She also liked the Raspberry Thyme Spritz with Basil made with raspberry puree. I enjoyed it along with a similar version with stawberry and cucumber slices. They were refreshing, but not overly sweet. I'm guessing that most of the wait staff were students at Olympic College. I heard Michelle mention to another couple that she was a local product from Bremerton. Before transferring to the University of Puget Sound, I attended Olympic College for a year taking business courses and commuting everyday from Tacoma. For dessert we had the berry cobler. 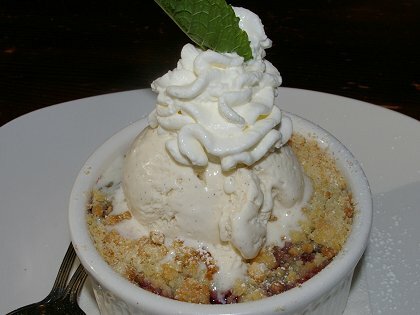 There were plenty of berries, ice cream, whipped cream and topped with a mint leaf. 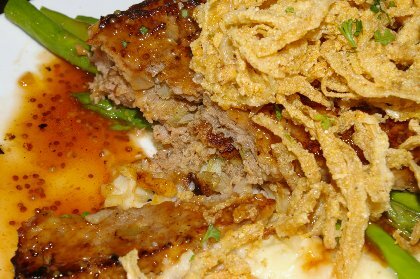 We would have liked it more a little less sweet and with more crust, but somehow the entire dish was devoured. Although we had problems with the hostess and the food, we would dine there again. I think it would be a very nice place to just sit and enjoy a warm afternoon . . . and evening. Outside in the sun would be fantastic on some of the those beautiful days we get between spring and fall. We would bring a jacket just in case and of course we could always move indoors . . . away from the dark little booths. Sunday morning I awoke early. I checked my email and then drove around the area a little bit. I drove a few blocks towards town and turned around at a drive-in coffee place. 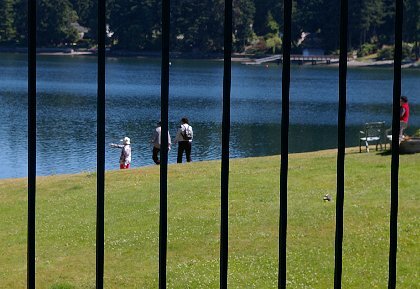 I looked through a chainlink fence down into a finger of Oyster Bay. I didn't realize that the little bay extended closer to Bremerton. I couldn't get a good shot through the fence so came back to the inn for morning breakfast. At most hotels you can usually figure that breakfast will start later on the weekends (this was Sunday), but not at Oyster Bay Inn. Generally breakfast ends at ten. At Oyster Bay breakfast begins at five in the morning and ends at nine. Oyster Bay Inn used to have a restuarant and we've dined there several years ago. Now the dining room is only open for breakfast. It's a little strange to see a baby grand piano standing near a breakfast buffet;however, the picture windows have a beautiful view onto Oyster Bay. The dining room like the office and lobby is located on the main floor (4th Floor). Although this gives the best view, the first floor rooms must open onto the yard below, while third floor and second floors have nice view. 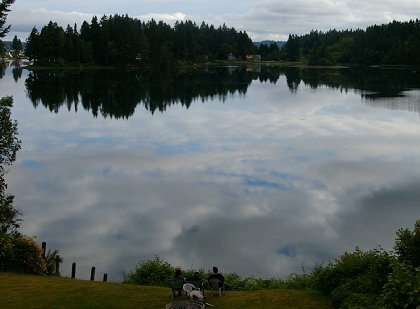 The waters were perfectly still and reflected clouds and sky. The upclose shot below of fellow guests enjoying the view looks like they are perched high on the top of a cliff, looking out into space, but in reality the water is just a few feet away from them. Peg got up and took her shower and then we discussed a plan for the day. We decided on a visit to Poulsbo. Although, Peg had visited there with her friend Kathy Whitacre when they had a getaway, we hadn't been there together in years. Poulsbo was founded by Norwegian lumbermen about a hundred twenty-five years ago. They loved the area and called it "Little Norway." There are dozens of quaint shops offering everything from used books to bakery goods and souvenirs. 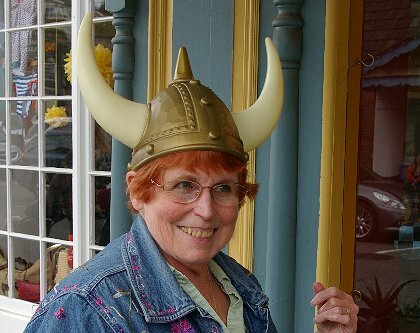 Peg looked natural in a Viking helmet showing off her Irish/Norse heritage. If our granddaughter Bailee lived in Poulsbo she could be elected "Little Miss Norway" with her abundant red hair. She has Irish roots on one side and Norwegian roots on the other side of the family. 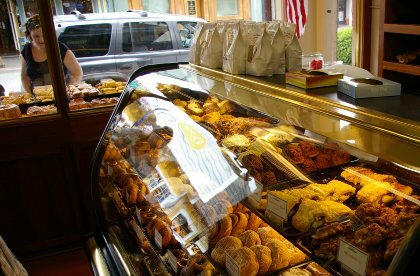 As we wandered the streets we spied Sluys Poulsbo Bakery. We had to visit and we had to buy. There were so many mouth-watering selections it was tough making a choice. I settled on two bear claws and a whole wheat honey muffin. I bought Peg an Apple Walnut Cinnamon Roll and she selected two double chocolate cake donuts. With these various treasures I thought we could share the wealth and do a little tasting on the way back to the inn and perhaps even give us a little late night snack as well. We weren't the only people in the bakery. There was a constant flow of customers coming and leaving. 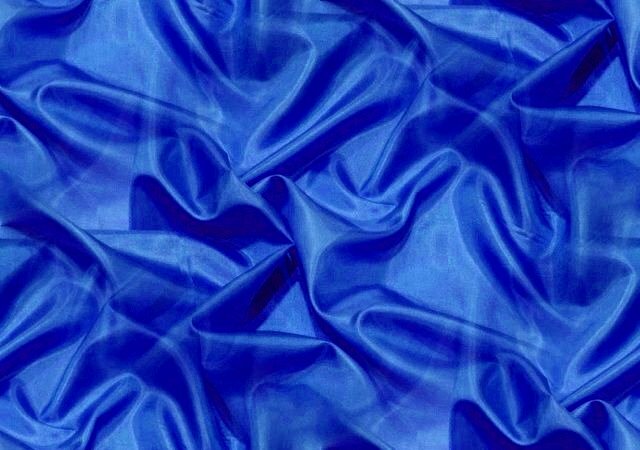 With the smells and colors you could almost taste the air. 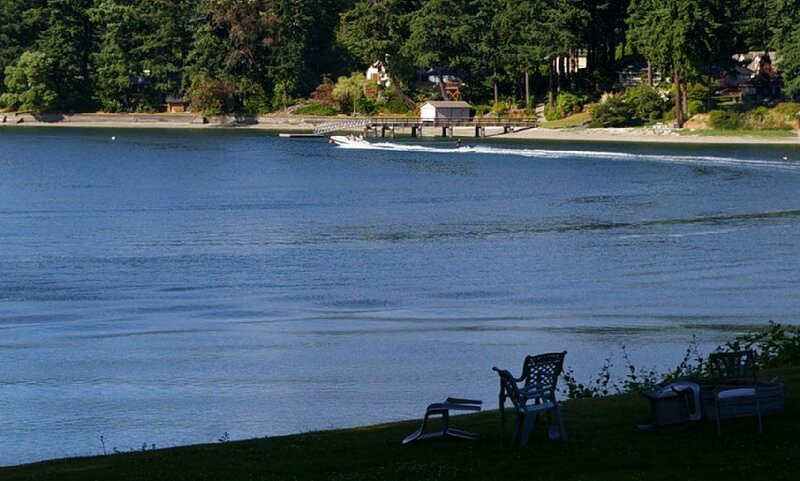 Poulsbo is right on the water of course. Between the main street and the marina are double-sided buildings with fronts on both sides; a parking lot and a linear park run to the water's edge. The marina was colorful with its array of boats. Long on my "to do" list is to rent a boat and stay onboard for two days, while remaining in the harbor. This would let us shop, eat, drink and relax all within about a hundred yards. That's easily inside my hiking boundary. I had been up longer than Peg so I suggested she visit one of the book stores, while I walked back to our car, which just happened to be parked directly in front of JJ's Fish House. As soon as I walked in, I was warmly greeted by a young gentleman in a black tee-shirt who asked me where I would like to sit. Great customer service. I asked for table for two near the window and was seated immediately. My server was Madi who had my Shirley Temple delivered in record time with fresh cut bread and little butter cubes. I was supposed to order a broth based soup for Peg, but the only broth based soup was French Onion, and I thought that was a little richer than Peg would like. 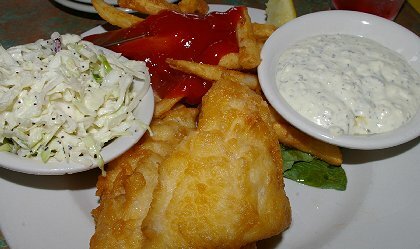 For me I chose the Cod Fry - "The finest Alaskan True Cod dipped in Tempura batter, deep fried in Canola oil and served with tartar sauce and our own homemade orange poppy seed coleslaw." The slaw was excellent. The next time I eat at JJ's I'll order an extra bowl of the slaw. I ate most of my fries which were much more than I had intended. The fish was nicely cooked. I gave a bite or two to Peg, too. 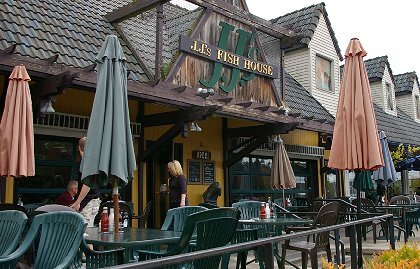 At JJ's the fish is cut by hand and all their sauces and dressings are made from scratch. While I ate and waited for Peg, another server saw that my Shirley Temple was nearly empty and asked if I need more. He returned with a small pitcher to refill my glass. Again, good service. Peg joined me with a small bag of "only" two used books . . . and a big smile on her face. Anytime she can find new books she likes, she's happy. She ordered JJ's play on bagel and lox. Instead of a bagel the lox was served on flatbread and (not mentioned on the menu)the cream cheese was in an oily concoction. This was less successful than everything else. Although I enjoyed the pita section I had, Peg thought it was too oily. 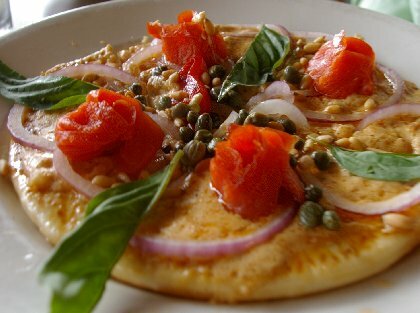 The lox was served as little rosettes, with garnishes of basil, capers, and pine nuts. Warm pita bread smeared with cream cheese along with everything else might have gone over very well. Heated all together the total was less than the sum of its parts. 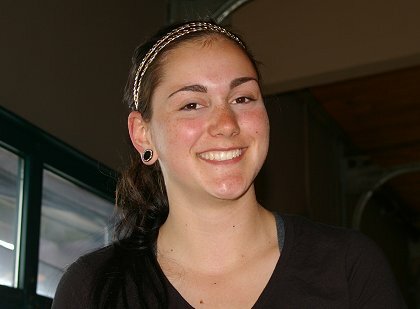 Like Michelle on Saturday night, our server Madi at JJ's was excellent. With a great smile, and a great attitude she elevated an excellent lunch to even great heights. The wait staff at JJ's was plentiful and helpful. They were constantly looking after their guests. I love that. If we ever rent a boat at the Poulsbo Marina, I will eat at JJ's, again. 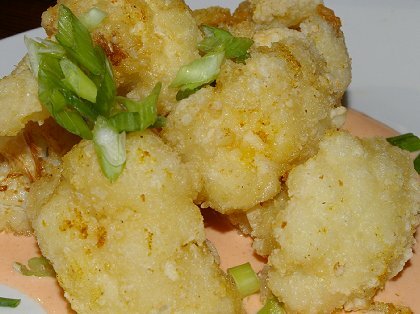 On their website I saw a photo of their fried oysters, a family favorite. It wasn't on the lunch menu, perhaps it was on the dinner menu. It gives me a good reason to return . . . as if I needed one. On the drive back to Oyster Bay Peg and I sampled a bear claw and a double chocolate donut. For me the donut was only okay, but the bear claw had much more date filling than I expected. Back at the inn I read while Peg sketched and had a great time by herself. With our two-day local vacations we manage to mix events with down-time. 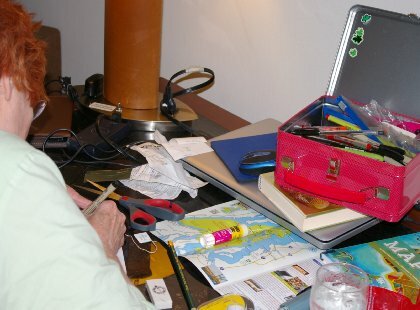 Since we maintain our offices in our home, sometimes it seems as if we are constantly at work. 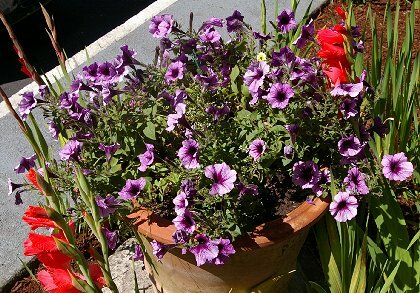 When we leave home, even if it's just a mile or two away from home to a nearby B&B or hotel we can just relax. At home we'd be trying to catch up with work or devising more online marketing strategies for our clients. It doesn't take long for me to slip into vacation and napping mode. Most of the pastries from Sluys Poulsbo Bakery made it back to our room. 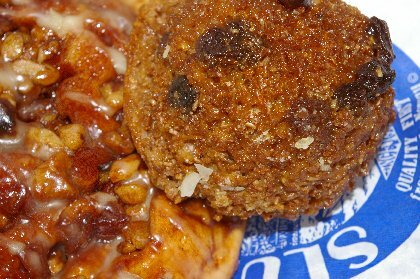 I shared my honey muffin and then later after a long afternoon nap was wondering about the Apple Walnut Cinnamon Roll. Peg informed that she had eaten it. I remarked that I had shared my choices with her. Her response, "You should have woken up earlier." It's tough to argue with reason. Indeed, I should have been more pro-active. I was a little disappointed, but not devastated. Our little bag of pastries cost less than ten dollars. I could have purchased a couple more selections and then been more vigilant. Naps, however, are an important part of our short vacations along with art, reading, and eating. Our room had a small balcony with blue metal bars for railings. As I lay across our bed I could position myself to read, watch TV, or simply stare out the patio door. All those choices worked well for me. Sunday morning I just laid in bed looking out at the view. I saw a contingent of Japanese women tourists. They were staying on our floor. I had nodded good morning on my way back from breakfast. I watched them walk across the lawn and step down to the beach. I thought that it might be nice to walk along the shore, but I had to get one more short nap in before we drove back to Tacoma. Besides, I don't speak Japanese. Oyster Bay Bremerton, oyster bay inn, poulsbo, bremerton, bremerton bar and grill, Sluys Poulsbo Bakery, jjs fish house poulsbo, Oyster Bay Bremerton Washington WA.